The "c" in "copyright" still stands for "censorship," at least when wielded by aggrieved entities with limited retaliatory options. Torrentfreak is reporting that Comcast has sent the site a cease and desist order over last week's article on Prenda's honeypot operations. [On] Monday we learned that Comcast was not happy with our coverage. Through the brand protection company Cyveillance they sent a cease and desist letter for an alleged copyright infringement, demanding that we take the article offline, or face legal action. The threats are clear. If we fail to comply with the takedown notice within five days Comcast will file a lawsuit seeking immediate injunctive relief, compensatory damages, statutory damages, punitive damages, attorneys’ fees and costs of the suit. The "intellectual property" in question is the public court filing, according to Cyveillance. (The actual C&D letter doesn't specify what's been infringed.) Torrentfreak told Cyveillance that public court filings are public domain (which may not be entirely true -- court documents filed by private parties (as opposed to the courts themselves) probably are not technically public domain, though there's a pretty strong argument that most uses of them are fair use -- and especially when it comes to use in reporting and commentary). After being informed of this fact, Cyveillance told Torrentfreak that Comcast said to "hold off" on removing the post for the time being, but that news came far too late as Torrentfreak's host was already threatening to pull the plug. Meanwhile, the situation further deteriorated when we learned that our hosting provider LeaseWeb received the same cease and desist notice. LeaseWeb alerted us to this problem on Tuesday and stated that our IP-address would be blocked if the issue was not resolved within 24 hours. 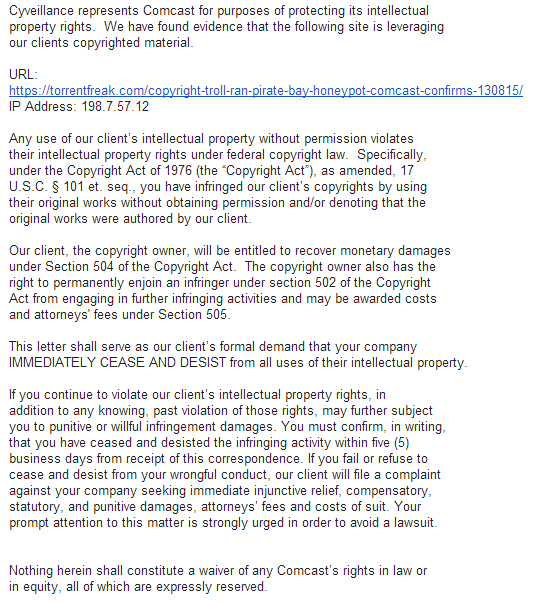 With Torrentfreak's site on the line, Comcast and Cyveillance then decided to turn unresponsive. Several hours later, Comcast finally issued a statement. Oh, one of those common "please take down our copyrighted content or prepare to be sued" mistakes. We've all made those. I'm pretty sure the only "error" was underestimating the pushback. So, all's well that ends well, I guess, except for that fact that Comcast's "error" nearly took a site offline and gets to walk away from the experience unscathed. And because it made it through with little more than some public embarrassement, it won't learn a damn thing. Re: Re: Wrote this short retort YESTERDAY, knowing you'd go with this, regardless. All takedown requests already are made under penalty of perjury. The problem is that nobody actually cares that the person making the request has perjured themselves, and nobody prosecutes.